ncern which has been appearing with more regularity in this viral video world we live in – that concern is protection. Protection from those who want to frivolously harm law enforcement officials trying to protect the public. Smith and Wesson presents to Law Enforcement the digital protection solution in the form of the Concealable Video Camera and Audio/Visual Evidence Collector. The Smith and Wesson camera series offers those that protect and serve the ability to have verifiable irrefutable evidence if the need ever arises, all in a complete, compact, yet very affordable package. For the ultimate in covert surveillance the Smith & Wesson Micro Concealable Video Camera which measures a mere 1.5″ × 0.75″ × 0.75″ (4cm x 2cm x 1.5cm) and weighs just 1.41 ounces (40g) is even easier to hide. This smallest of cameras also features a high video resolution of 640 × 480 pixels at 30fps and is capable of taking 2 megapixel still images. 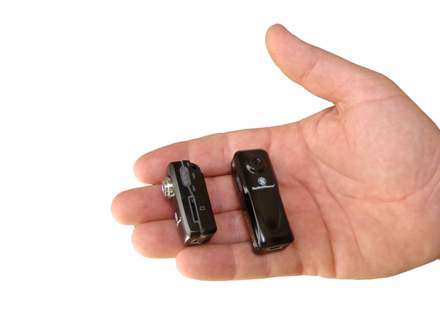 The Micro Concealable Video Camera also comes with a 4 GB Micro SD card and its battery runs at full power for one hour.